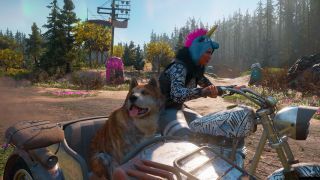 While Boomer was the furry star of Far Cry 5, with the new post-apocalyptic Far Cry New Dawn, it's actually Timber that's taking that particular crown. And thankfully, when working out how to unlock Timber the dog in Far Cry New Dawn, it's actually pretty easy to find him incredibly early on in the game. He's a handy pup to have around too, as he’s capable of tagging enemies (and later loot and crafting materials too), which is useful when taking on Outposts or trying to do them entirely undetected. Plus, if you let him ride shotgun he'll hang his head out of the car window, ears and tongue flapping in the breeze, and looks genuinely adorable when in the sidecar too. All he needs now is some goggles. Handily, Timber is one of the first of the Far Cry New Dawn best Guns for Hire you can unlock in the game (after Carmina of course). So if you want this furry four paws on your team, head over to the Meatfort, to the northeast of Prosperity, and just east of the Broken Forge outpost to trigger Timber's quest (if you haven't already triggered it by speaking to one of your scouts, which appear on your radar as blue squares with exclamation points inside). Now before you go charging in, if you love dogs as much as I do, you're going to want to prepare yourself. The Timber quest is called "Man Eat Dog World", and it basically does exactly what it says on the tin - the Highwaymen are eating dogs. You're about to go and rescue Timber from one of a butcher's block, where another of his canine pals is about to meet his fate - cue sad dog noises and me crying a bit. Thankfully, you'll have to start the quest by taking out any of the Highwaymen you find (which I did with glee), and then you'll find Timber caged up looking incredibly sad. Give him a little scratch behind the ears, and he'll be your BFF for life. But he'll also turn into some kind of Lassie pulling off that concerned canine "Timmy's in the Well" shtick, and you’ll need to help him out. He'll start jumping up at a metal door, but the area you need to head into is opposite the cage Timber was being held in. Vault the wooden panel and head to your right, and you'll see the telltale blue ropes hanging down letting you know there's a ledge to jump up on. Keep following the rooftop ledges around - Timber will guide you from the ground - until you get to the top of the cages with more of the akita's deceased friends in them. You can drop in from the gap in the top, and then you'll find a key next to one of the bodies. Turns out, it's the key for Timber's ALIVE friends, so all you need to do is go back to the area you found Timber in to release them! YAY! Some good news! Free the furry pals, and some more goons will arrive - because you basically just set their dinner free - but you'll now have Timber as your Fangs for Hire, and he takes just as much pleasure from taking the Highwaymen down as you will after that disaster.